This summer the Hôtel Lambert case took a surprising legal turn. 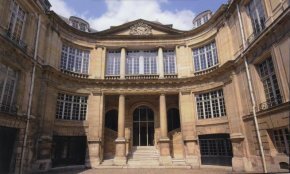 The authorization permit issued by the Ministry of Culture (see news item of 23/6/09) was appealed before the Tribunal Administratif of Paris by the Association Paris-Historique. After hearing the various sides and requested further information, a decision has been postponed until a new hearing on 8 September at 15h has taken place. The subject is a complicated one and all the ensuing ins and outs are difficult to understand. We would have liked to study the plans with an architect, but were told this was not possible. The Association Paris-Historique was able to do this work (already undertaken by the Commission du Vieux-Paris, which had initiated the controversy) and has produced a rather clear file which we were able to consult. Claude Mignot, on this site (see the article in French), explained that there were still several concerns outstanding which become obvious when reading the documents. In order to clarify the debate, let us summarize the main reasons for which the association has challenged the ministry’s authorization. 1. Digging the grounds. This is undoubtedly the most controversial issue, especially since the Hôtel Lambert, like all of the buildings on the Ile Saint-Louis, is of course constructed on piles. Even if the chief architect abandoned the project for a parking lot under the garden and placed it instead under the courtyard, this still remains a problem, raising serious questions concerning the building’s stability. However, it is perfectly possible to park the cars in the courtyard and on the ground floor of the left wing where a parking spot had already been provided for several cars. On this point, as for others, the plans for the project are vague, although not immediately obvious to an amateur. Paris-Historique also pointed out the lack of detail in the drawing for the ventilation unit enabling the renewal of the polluted air in the parking lot and which would be installed in the garden. 2. The chief architect’s creations. Although downsized compared to the original project, the alterations to the façades and roofs are still significant and not totally justified, for example, the creation of fake woodwork (that is, painted on) adorning the right façade, street-side. The same can be said of the gable windows to be placed on the central structure of the façade, street-side, the sculpted flower baskets (from engravings) or the pots-à-feu on the Hercules gallery wing (also from engravings). 3. The elimination of old elements which are not “original”. This is the case, for instance, for the 18th century gable windows of the courtyard façade and some chimney shafts. 4. The replacement of the stones. According to Paris-Historique, over half the stones covering the façade will be replaced, something not justified by their current condition. Still according to the association, the company which has been approached for the work carried out the tests on the stones thus creating a conflict of interest. 5. The raising of the parapet on the garden wall. The main problem here – and we do not understand the need to raise the parapet, even for safety reasons – would be the fact that the harmony of the horizontal line joining the façade on the quai with this wall would be broken. This might seem a minutia but as the saying goes, the devil is in the details. 6. The installation of air conditioning. According to the architect, this is not strictly speaking air conditioning but a system for circulating hot and cold air. Nevertheless, a pipe system will have to be installed. During the visit set up for the media, we were informed that these pipes already existed. But it is true that the plans for this part of the project are not very specific, thus creating another cause for worry. 7. The reorganization of the interior. During the visit organized for the media, we were reassured that the overall volumes would be respected and preserved. When looking at the plans, this is far from being true. The whole interior will have new walls and some fireplaces will be eliminated. Even if the décor is no longer original, it would be legitimate to wonder if these changes are justified. Paris-Historique judges this to be “façadisme”, or simulation, a rather excessive term perhaps. 8. The mutilation of the Jean-Baptiste Lambert cabinet room. Even if the suggested elevator will no longer leave holes in the ceiling, the plans show that this room will have its current volume reduced by a third due to several partitions and the destruction of the fireplace dating back to the 18th century. 9. The destruction of part of the Neo-gothic elements. Although the conservation of the Lassus staircase and of the stained-glass windows has been agreed to, there are plans for destroying the décor and the fireplace of the room known as the “atelier”. This change to the 19th century installations, linked to the period when the hôtel was inhabited by the Czartoryski family led the Polish ambassador to express his concerns for the restoration project in a statement to Frédéric Mitterand a few days ago. 10. The installation of two bathrooms above the Hercules gallery. According to the Ministry of Culture, this part of the project has been abandoned. Still, the Association Paris-Historique has pointed out that these two rooms still appear on the plans approved by the Ministry of Culture. The association emphasizes that : “allegations and promises [have been] substituted [in this project] in place of binding documents, the basis for any discussion or possible dispute.” We would tend to agree. Although some points have been improved, the current project still lacks specifics and presents too many negative aspects, thus explaining the action taken by Paris-Historique. On a more general level, this case once again raises the problem of restoring historical monuments in France. The reconstitution of dubious elements from old engravings and other, often, unreliable and contradictory sources is an age-old question which we have often discussed here, notably as concerns Versailles. The same is true of a return to previous historical states. The excessive and unnecessary replacement of old stones with new ones also occurs frequently on too many sites. However, the transformation of monuments into establishments welcoming the public is very often even more destructive than those for private use. Although many of the aspects concerning the rehabilitation of this hôtel remain debatable, we dare not imagine what would happen if it were to be transformed into a museum. We would like to see other restoration projects raise the same fervor as that sparked by the very legitimate concerns surrounding the Hôtel Lambert.